Returns are king for investors, irrespective of the asset class. A report by Reidin reveals that properties in Dubai provide among the world’s best investor returns, closely behind the tech-heavy Nasdaq index and Singapore real estate. An analysis of returns (appreciation and rents) over the past 10 years reveals that among real estate assets in major cities (Dubai, New York, Singapore and London), Dubai and Singapore property assets have returned close to 120 per cent whereas London and New York have returned 75 per cent and 63 per cent respectively. This trails the Nasdaq which yielded the highest returns of 138 per cent since 2007, driven by the boom in tech stocks. The bulk of returns in New York and Dubai have been in the form of rental returns, whereas Singapore has been in capital gains. “There is a huge rental market in Dubai, professionals who only see themselves living here for between one and two years will often opt to rent properties rather than buy. Because of this basic rule of supply, landlords have the ability to ask for higher-than-usual rental amounts. This point, supplemented by purchase prices [which are still at a low point], ensures attractive yields for all landlords living in Dubai,” says Myles Bush, CEO of PH Real Estate. “Dubai is relatively very new when compared to other global real estate hubs and has thus been perceived by early investors as carrying a higher level of macro risk than other more mature and older markets. However during the global financial crisis, the Dubai real estate market saw stronger regulation being introduced, a curb in speculation and added diversity in its product offerings. 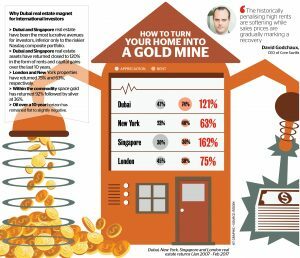 Although the market is at the bottom of the cyclical trough, it is still providing high rewards for long-term investors with a relatively lower risk profile, particularly for mid to prime assets in core locations,” says David Godchaux, CEO of Core Savills. 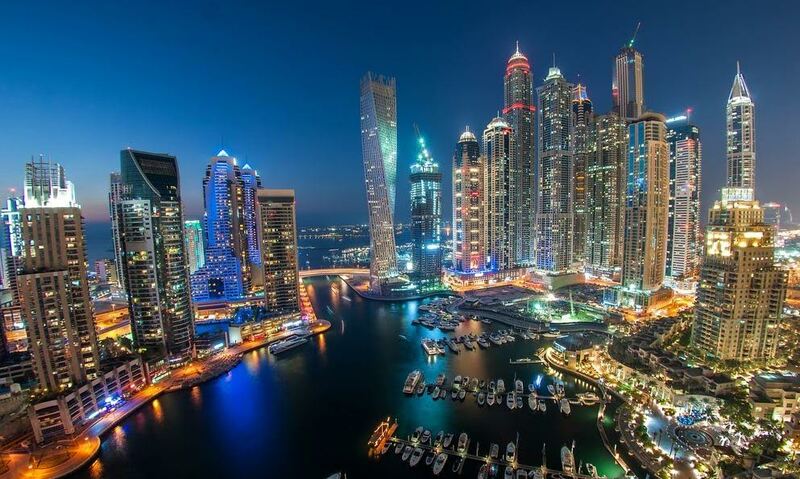 Property returns per annum in Dubai have ranged between five per cent to 11 per cent. If an investor is purely looking at rental returns, smaller units such as studios and one-bedroom apartments in areas with high demand and low service fees – such as Discovery Gardens, Jumeirah Lakes Towers and The Greens – are ideal. “However, when it comes to capital appreciation, look at the top of the market and especially towards Emirates Hills. Right now, there is a real shortage of super prime villas. Sure we have Dubai Hills, however, I feel it will never compare to the address and prestige offered by Emirates Hills. As we see more and more ultra high net worth individuals coming to the region, I can see first-hand that there is a real demand shortage, thus likely to drive prices upwards,” adds Bush. Godchaux believes that prime and mid-market assets in core locations have historically provided higher capital appreciation as they possess an iconic value, better build quality, views, facilities and connectivity. However, Dubai is now witnessing a steady yield compression. “The historically penalising high rents are softening while sales prices are gradually marking a recovery, especially in the mid-market segment in the price range of Dh1.5 million to Dh3 million,” informs Godchaux. Since 2009, Dubai property has offered more than three times the returns in comparison with Abu Dhabi. Although the rental returns of both cities are close to parity, Dubai experienced superior capital gains. The difference in capital gains was due to a number of factors, such as different launch prices, skewness towards the luxury segment in terms of Abu Dhabi and a wider number of community and unit launches in Dubai. “Abu Dhabi still has a little way to go before it competes with the demand, thus high returns, that Dubai has enjoyed for the past few years,” says Bush. “The Abu Dhabi residential market has a higher ratio of luxury and prime segment and is predominantly leasehold, therefore relatively less elastic to changing market conditions. However, as there are diversified product offerings in the planning stages, we are bullish over a five-year horizon that should see price recovery when a lot of the new stock is absorbed,” concludes Godchaux.